Pope Benedict XVI has appointed Archbishop Joseph W. Tobin, C.Ss.R., the Archbishop Secretary of the Vatican Congregation for Institutes of Consecrated Life and Societies of Apostolic Life, the sixth archbishop of the Archdiocese of Indianapolis. Archbishop Tobin, 60, succeeds Archbishop Daniel M. Buechlein, O.S.B., who was granted early retirement by Pope Benedict on September 21, 2011 for health reasons. Since Archbishop Buechlein’s retirement, Bishop Christopher J. Coyne has served as the archdiocese’s Apostolic Administrator. 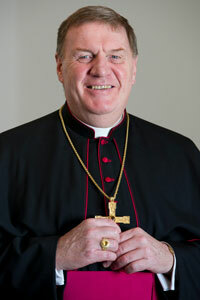 Archbishop Tobin, a Redemptorist priest, is a native of Detroit. He was born May 3, 1952 and is the oldest of 13 children. He was educated at Catholic schools. He studied at Holy Redeemer College in Waterford, Wis., where he earned a bachelor’s degree in philosophy in 1975. He also studied at Mount Saint Alphonsus Seminary in Esopus, N.Y., where he received a master’s degree in religious education in 1977 and a master of divinity degree in 1979. As Archbishop Secretary of the Congregation for Institutes of Consecrated Life and Societies of Apostolic Life, Archbishop Tobin worked in the Vatican to oversee the more than 1 million men and women in the world’s religious orders. Archbishop Tobin has served as a parish priest in the inner city in Detroit and Chicago. As associate pastor of Holy Redeemer Parish in Detroit from 1979 to 1984, Father Tobin was responsible for ministering to the Hispanic community. He served as pastor of Holy Redeemer Parish from 1984 to 1990. He then served as pastor of St. Alphonsus Parish in Chicago from July 1990 until October 1991. Archbishop Tobin served as General Consultor of the Redemptorist congregation from 1991 to 1997 and as its Superior General from 1997 to 2009. He was appointed by the Pope to five Synods of Bishops in 1998, 1999, 2001, 2005 and 2008. Archbishop Tobin speaks several languages including Spanish, Italian, French and Portuguese and reads several other languages. Archbishop Tobin will be installed as Archbishop of Indianapolis on December 3 -- the feast day of St. Francis Xavier, the patron saint of the archdiocese -- at SS. Peter and Paul Cathedral in Indianapolis. Details of the Mass are pending.